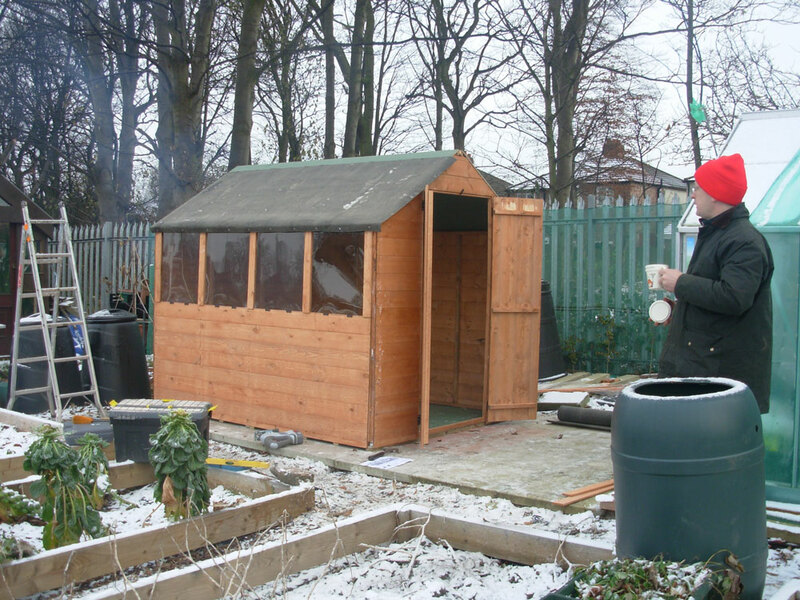 A photographic diary of the progress on our Allotment in Knotty Ash, Liverpool. 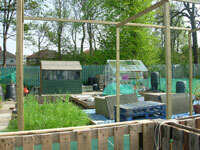 I can’t believe that it has been a year since my last post but we have been busy at the allotment. Last year’s harvests were not as good as we had hoped so once everything had been harvested Allan took several trips to the local riding stables, filled the boot of the car full of manure and put a good thick layer on all the beds. 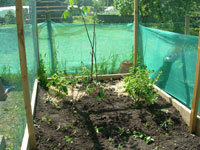 We then covered the beds with the old carpets and left them for the winter. 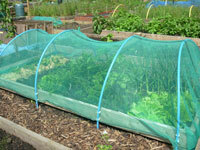 This year we decided to try growing our vegetables through weed suppressing membrane which will reduce water loss as well as cut down on the weeding. We started with the potatoes putting a double layer of fabric down, cutting a cross in the fabric and planting the seed potato beneath the cross. The plants easily grew through the cross and we haven’t had to weed the bed at all. Other beds we put a single layer of fabric but we have found that the sun degrades the fabric and it tears easily so next time we will use a double layer on every bed. The spring took a long while to warm up, particularly the nights, so some crops we put out failed and others were very slow to take off. 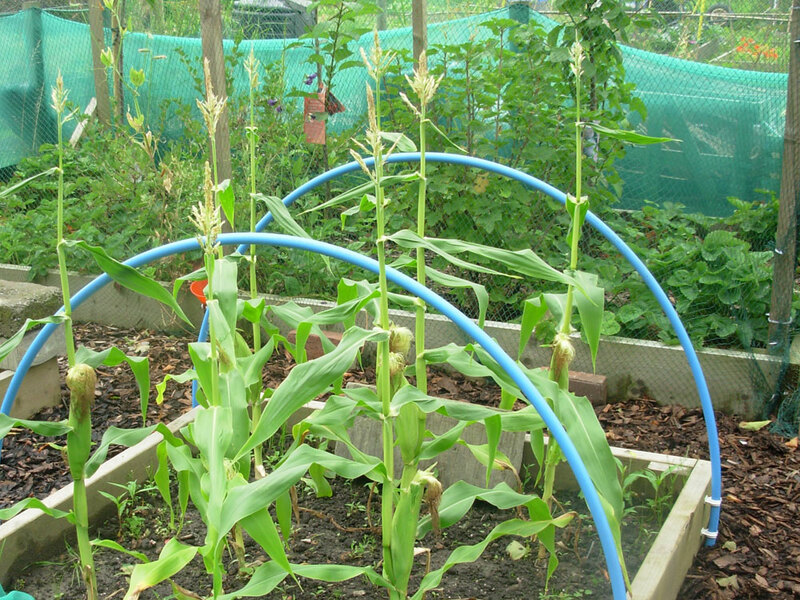 However, things are growing well now and we’re loving the sweetcorn; think we should get a good crop this year. The added manure to the beds certainly seems to have helped, not only the quality of the crops but it has also helped keep the weeds down where we didn’t use the weed suppressing membrane. 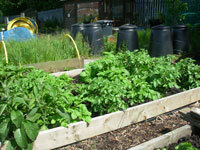 This year we have run an experiment with the potatoes, growing some in the ground and others in potato sacks. If the quality of the potatoes from the sacks is better than those grown in the ground we will continue to use them although keeping them watered was a bit of a challenge. 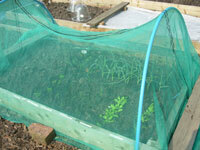 We have also grown our show carrots in containers in the greenhouse and so far they are looking good. 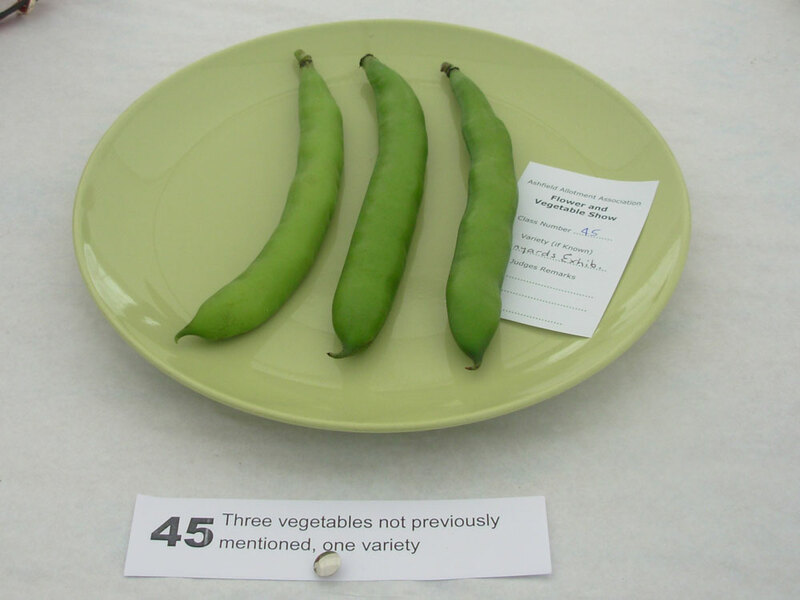 The 2015 Flower and Vegetable show is on 15th August so we are deciding what we want to enter. 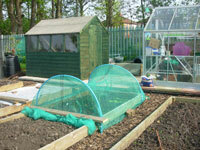 So far it will the potatoes and carrots and if we have three similar size and shape onions we will enter those too. If the sweetcorn is ready we will enter a cob too. I will also enter my jam and chutney from last year’s harvests. Saturday saw the 2014 Ashfield Allotments Flower and Vegetable Show and we entered 21 classes, including Jams & Chutneys and Photography. 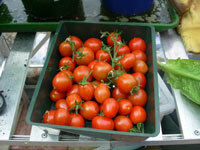 When it came to the day we were disappointed in some of our produce but in the end we did quite well. We got four first prizes, four second prizes and one third prize. 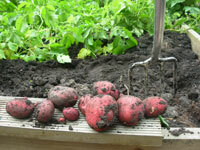 It is now early July and we have had our first harvest of potatoes. I think the labels may have been moved as the label said these were Juliette but they look more like King Edward to me. Either way they are very tasty. 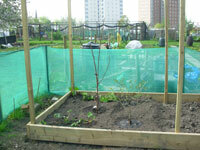 This is the first year that we have had a fully secure fruit cage so the soft fruit has been really good. This photograph was taken early June just as the Red Currants began to ripen. 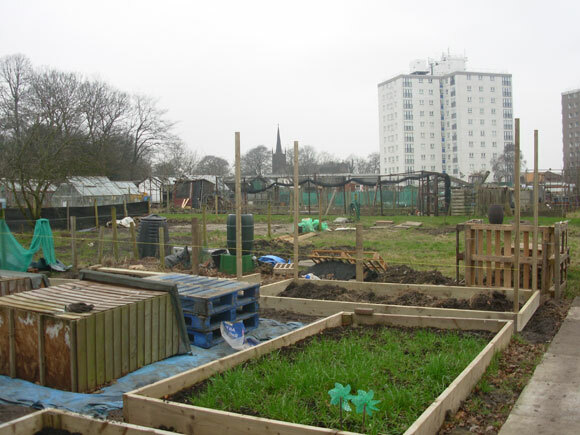 This photograph was taken quite early in the year but shows the completed raised beds and bean / pea support down to the fruit cages. 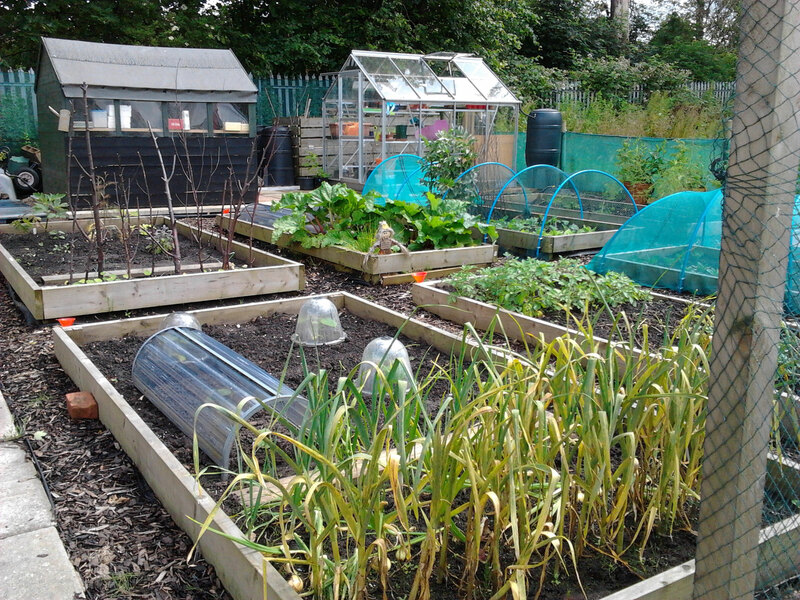 The flowering plants at the allotment were looking lovely today so I have taken some photographs to show them off. This month was the Flower and Vegetable Show at the allotments, unfortunately it rained so turnout was lower than we would have liked but it wasn’t too bad. 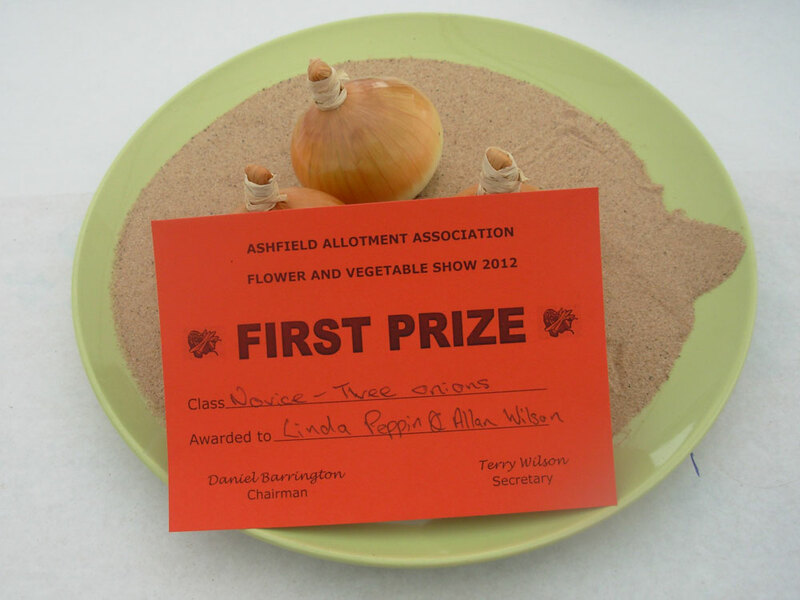 Our crops haven’t been very good but we managed to get a few good quality carrots, three of which were good enough and similar to put them in the show; and we won 1st prize! We also entered “Dish of Soft Fruit” with our blueberries but, unfortunately, we were not placed. We also got another 1st prize in “Photograph – Ashfield in Bloom” with our photograph of the Poppies taken taken in June. We’ve had nearly five weeks of hot sunshine and no rain until the last couple of days when the rain has come down in torrents and it came with thunder and lighting! The first ever Cauliflower grown on the allotment. It was grown from a plug plant not seed but it’s a start. We planted this Grape Vine in a pot as the ground itself gets too wet in the winter. I didn’t expect anything this soon but here we are. Let’s see if they mature into “real” fruit! This is our first and only Walnut. I’ll post a photograph when we harvest it. Blueberries just turning. Love it when they are different colours. The weather has finally improved and although we are still getting some rainy days, we have also had quite a few very hot days with temperatures in the greenhouse going up well into the 30s. However, at the back of our plot there is a band of very tall, mature trees which block the sun from one half of our plot until around lunchtime each day. We view this with a mixture of feelings; the lack of sun means that the ground doesn’t dry out as quickly but it also means that the crops in the beds in the shady area take quite a long time to develop. 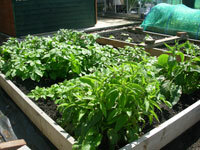 We will have to be careful what we plant in those beds if we want to have decent crops in the future. The asparagus bed which we planted three years ago is not at all productive and the half which is in the shaded area hardly produced anything at all! We have now decided to prepare one of the sunnier beds over the autumn and plant some new asparagus plants along with the ones which are still producing. Hopefully the year after next will see a good sized crop. The cutting bed has been great this year with all the spring bulbs flowering well and the poppies we had last year have self seeded all over the bed and the display is amazing. Last year none of the Brassicas germinated and the plug plants we bought just ran to seed so we are surprised that this year germination has been good and the seeded brassicas are now the same size as the ones planted from plug plants; think we’ll have a glut of Cauliflowers, Cabbages and Sprouts this year! 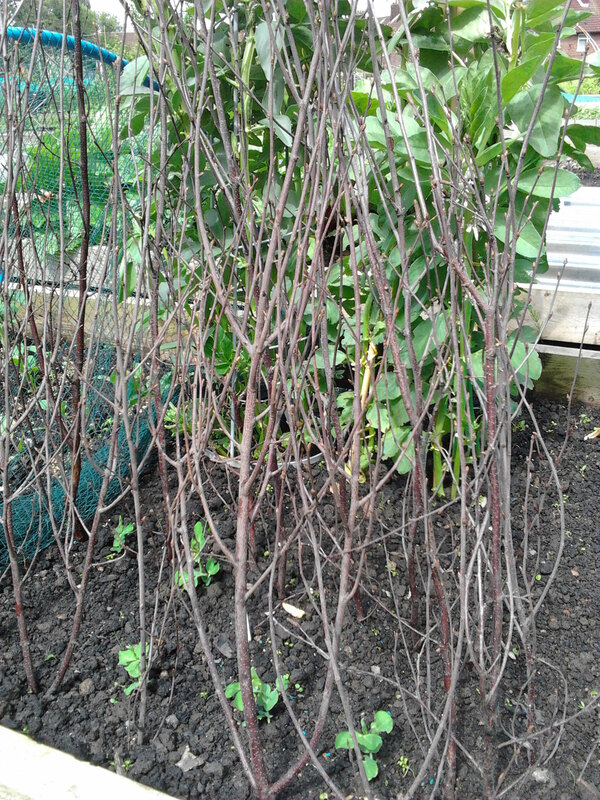 I was a bit concerned back in April when I had a senior moment and planted the potatoes too close together! However, having spoken to a few people it seems that is may not make too much of a difference to yield so I left them in place. They have all sprouted and are now in flower so I will know if I have done the right thing when I harvest the first earlies in a couple of weeks time. Some of our Raspberries failed over the winter so we took the opportunity to plant a summer fruiting variety to compliment the autumn fruiting ones. They are all doing well and fruit has started to develop so we should have a good crop. You may remember that some nice soul at the allotments decided to steal all our apples last year and we were a bit concerned that they may have caused some damage to the spurs. I think that is the case as we don’t seem to have as many young apples as we did last year. The good news is that both pear trees have lots of small pears already, we have had some drop off but I think that is normal. 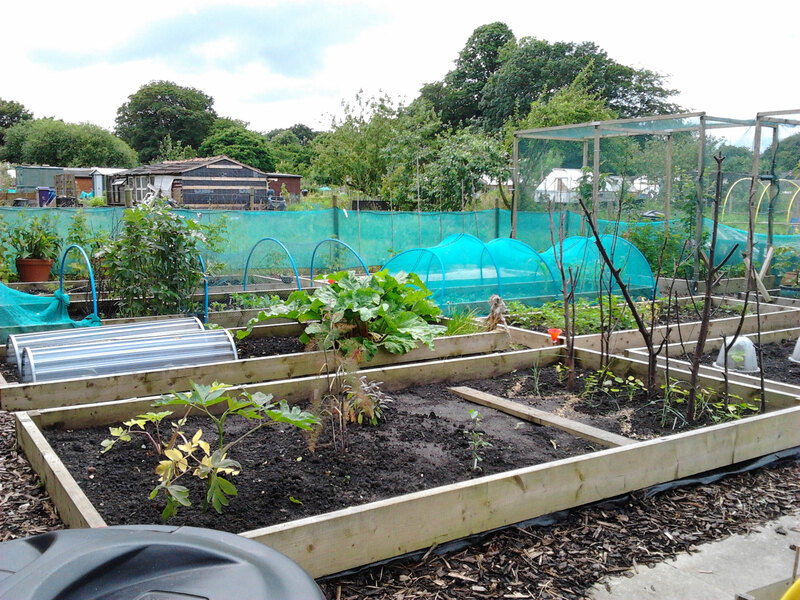 When we built the fruit cages we netted them with normal garden netting which began to tear at the end of last year so we have decided to replace it with chicken wire. It is going to be a big job but hopefully if will last for many years so it will be worth it in the long run. We are also hoping it will deter future thieves! Because the fruit hasn’t been protected the birds managed to get to our Red Currants before we could but our Black Currants and Gooseberries are still on the bushes so we’re hopeful. 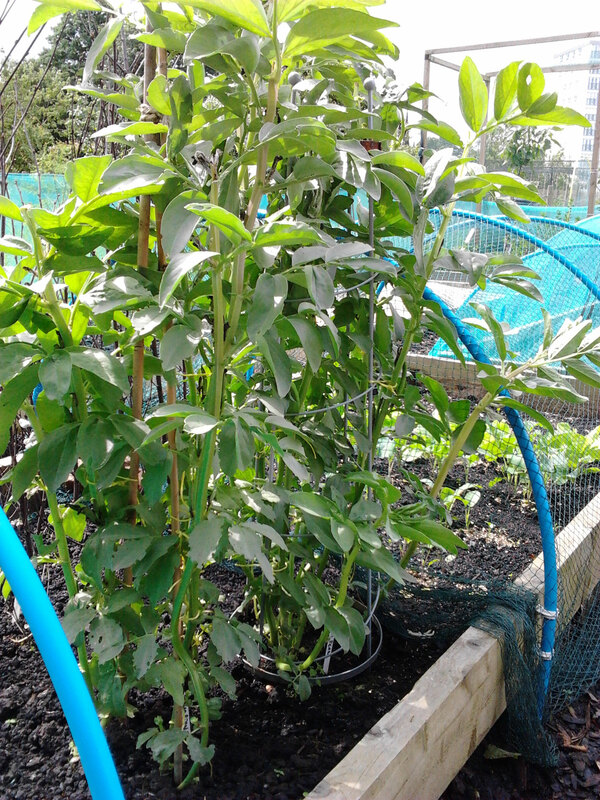 The peas are all doing well too and for the first time we have sown Borlotti Beans which also seem to be doing well but are still quite small, not convinced that it is warm enough but we will see. 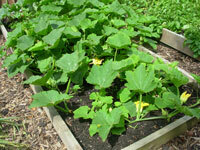 The Pumpkins and Squashes have not been in for long and are still tiny, but putting on growth by the day. 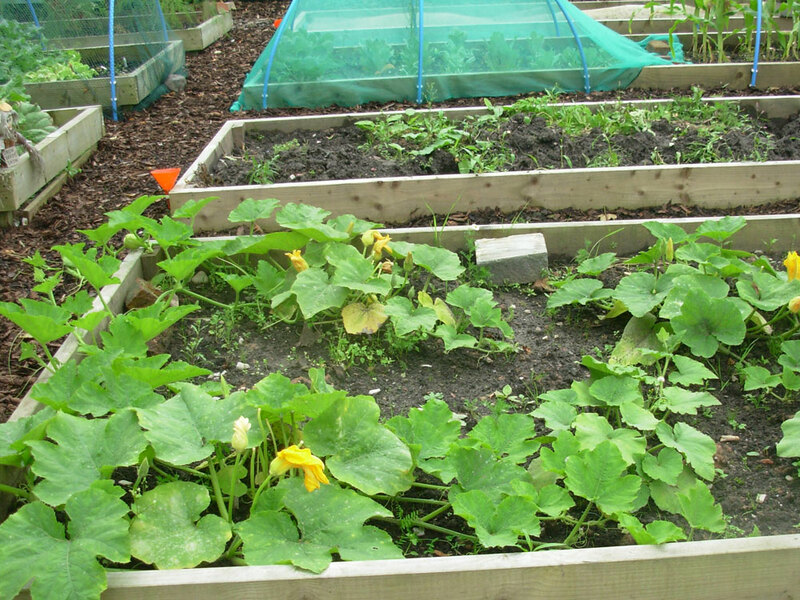 Pumpkin bed and Rhubarb bed. 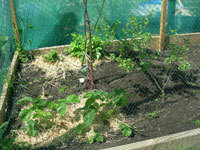 Rhubarb bed with cutting bed behind. 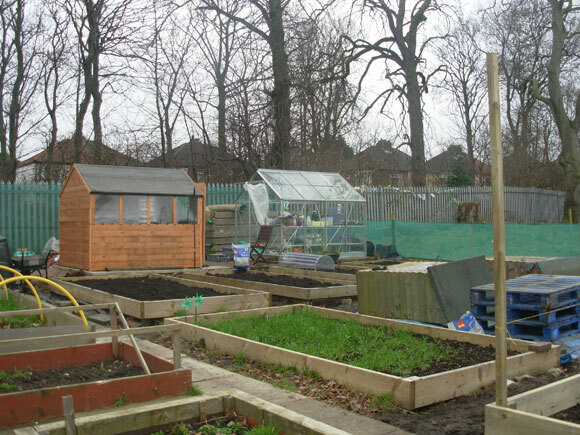 As most of you are aware the bad weather continued right up to the end of April so there has not been much progress at the allotment. Most of the seeds sown over the winter didn’t survive due the cold and damp in the greenhouse so, in affect, we have had to start from scratch. 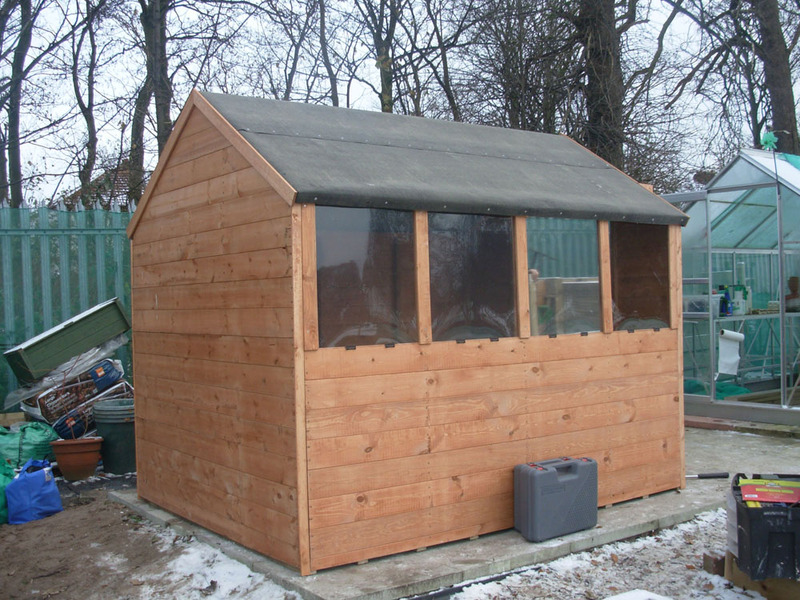 Last week the temperature in the greenhouse was still going down to just 1.5 degrees C so extra warmth was still required. Despite the code some seeds have begun to germinate so we’re on the way! Although late, the pear, apple and cherry trees have great blossom so are all promising. However the plum tree still has no blossom so I suspect we won’t be seeing any plums this year. Cleared beds awaiting planting but the Rhubarb has done really well despite the cold. Cutting bed. Mainly spring flowering bulbs at this time but herbs just waiting in the wings. 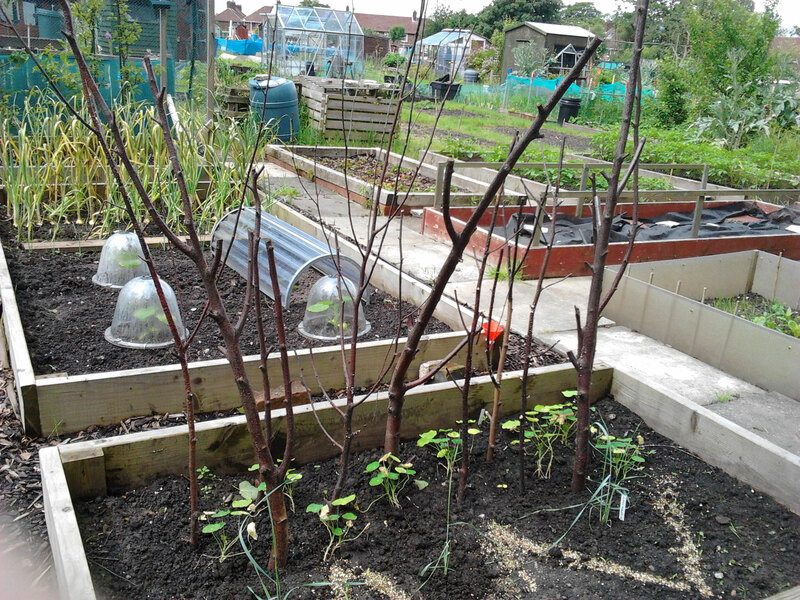 Fruit Cage containing the Pear and Apple trees as well as Blueberries and a Grape Vine which isn’t looking too good at the moment. Apple Blossom. A bit behind the pears but still promising. The end of last year on the allotment was quite uneventful except for the fact that someone decided they liked the look of our apples and gradually stole them all before we had a chance to eat any of them. We have two apple trees and a pear tree in our fruit cages but it was just one of the apple trees which fruited and we were quite excited to try them as they looked lovely. Not sure what we can do to stop it happening this year but I’ll keep you informed and try to get some photos before they all go.I think most people struggled to get a decent potato harvest last year and we were no exception. I think we got, maybe, 20 potatoes in total. I don’t think it was blight that got to them, I just think we planted them at the wrong time. It was too wet for too long then we didn’t get enough sun so they just rotted off.I have just started chitting this year’s seed potatoes; we are going for King Edward, Pentland Javelin and Julliette which will give a good spread of cropping. We’re not going to try any heritage varieties this year as we want to ensure we can get a good crop before trying anything more difficult. All beds have been cleared and covered over for the winter and Allan will begin digging them over just as soon as the weather improves. 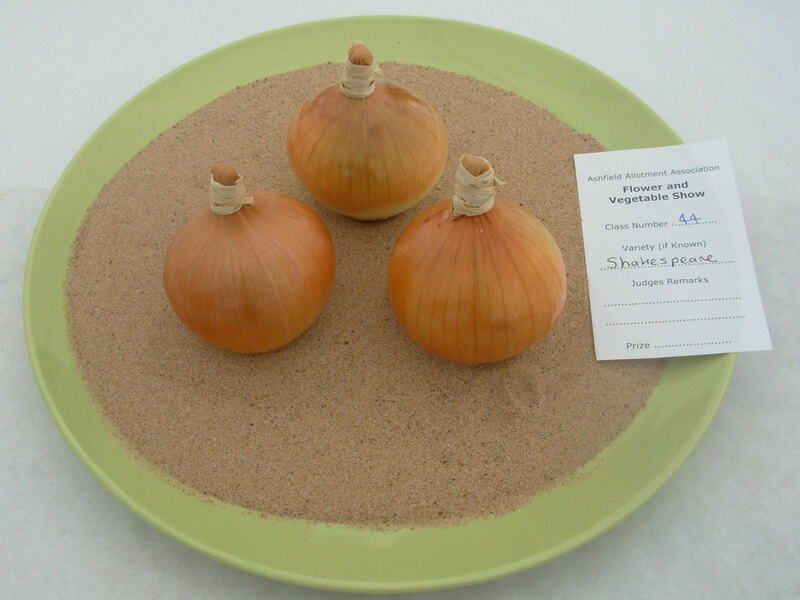 Last weekend was the Allotments’ Flower Show and Allan and I entered two novice classes; onions under 250g and other vegetable. 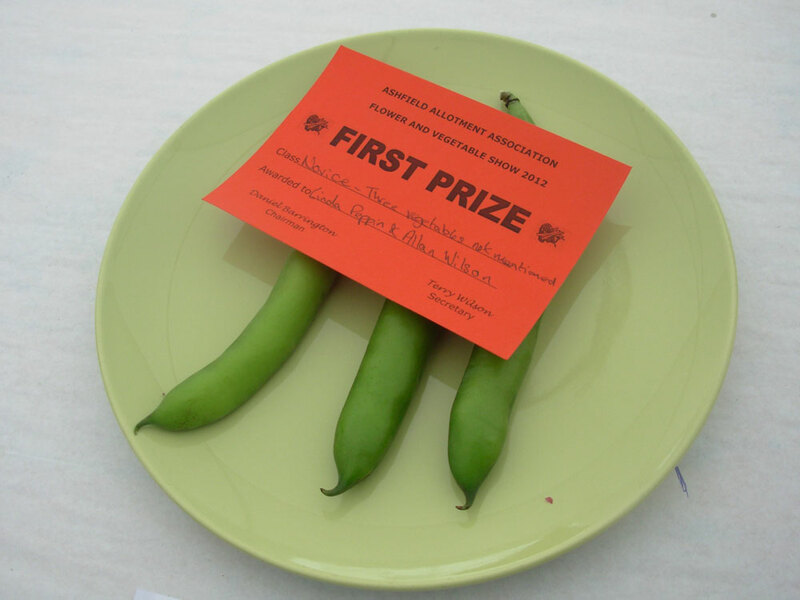 The good news is that we won both classes but we were the only entry in the other vegetable category with our Broad Beans and there was only one other entry in the onions class. Now we have won a first prize we won’t be able to enter any novices classes in the future so our eye is on the full classes next year. 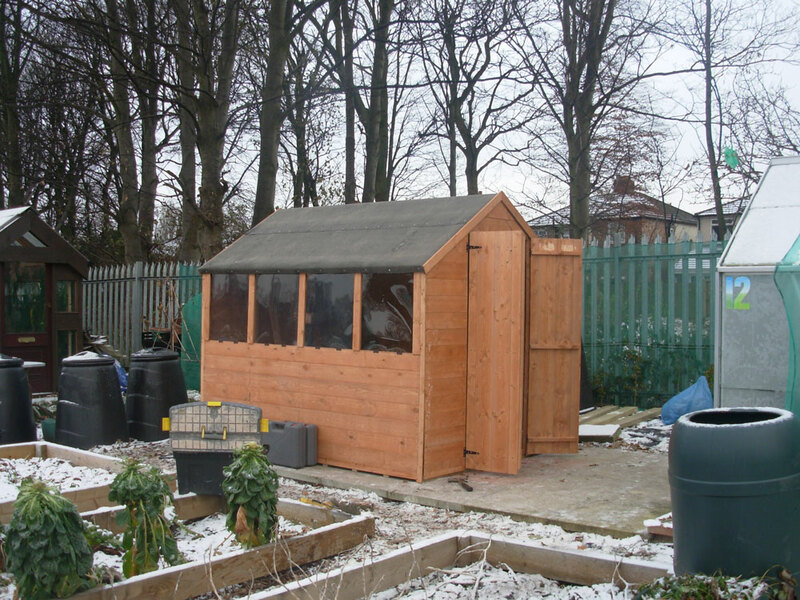 There are some photographs below.The allotment is doing ok but almost all of our potatoes have rotted so we are digging over that bed for next season. The cauliflowers and cabbages are not doing too well either although the Savoy and Sprouts are looking good; I think the caulis and cabbages will end up in the compost heap. 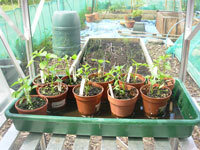 Tomatoes, peppers and chillies in the greenhouse are all looking well so we should have a nice crop in the coming weeks. 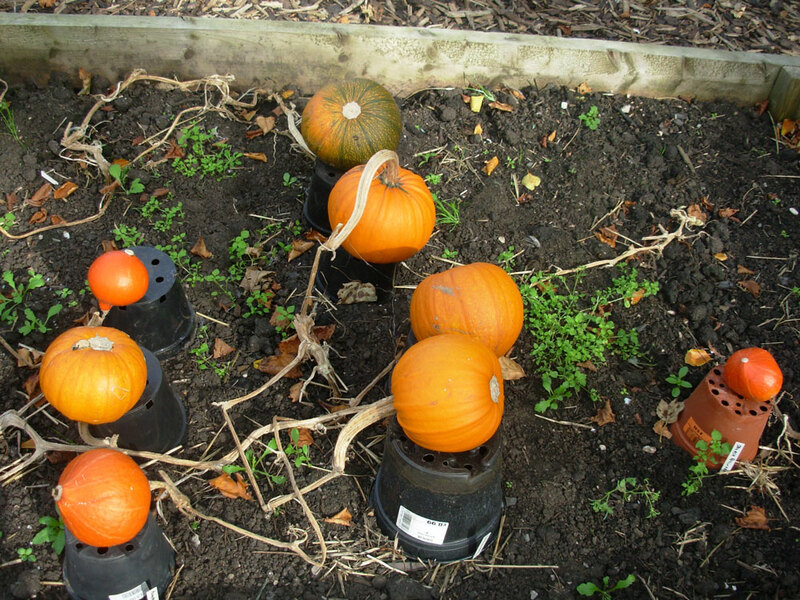 The same can be said for the Sweetcorn and the Pumkins and Butternut Squash; all looking good. 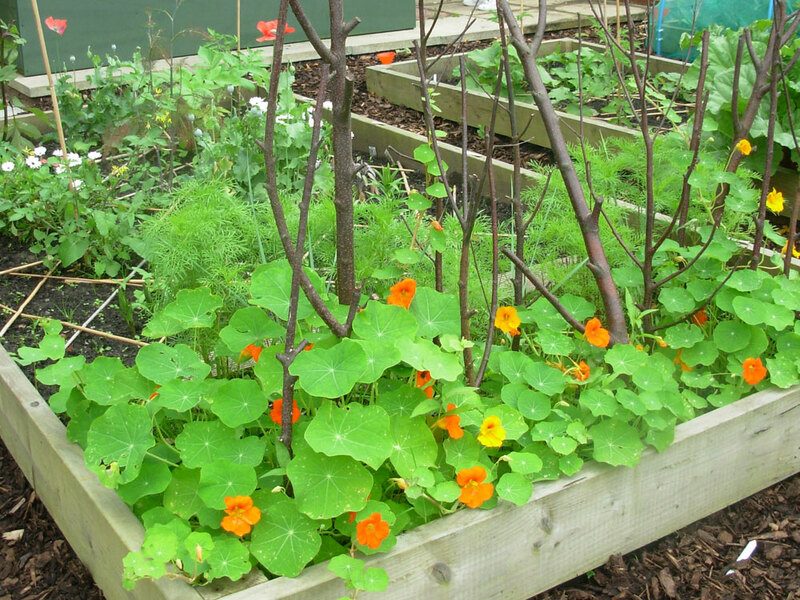 We planted up a “flower” bed which contains perennial herbs and each year we will plant up with annuals and other flowering plants to add colour and scent to our plot. This year we are growing Nasturtiums and Morning Glory up some twigs and below we have Cosmos which should be flowering soon. Things are finally beginning to grow properly at the allotment, the cold, wet weather we’ve had for most of the “summer” has meant everything is behind.The sweetcorn is doing particularly well but it’s still under cover to help protect them from the birds but the cover will come off once they outgrow it. The broadbeans are also doing well and I harvested our first handful today. 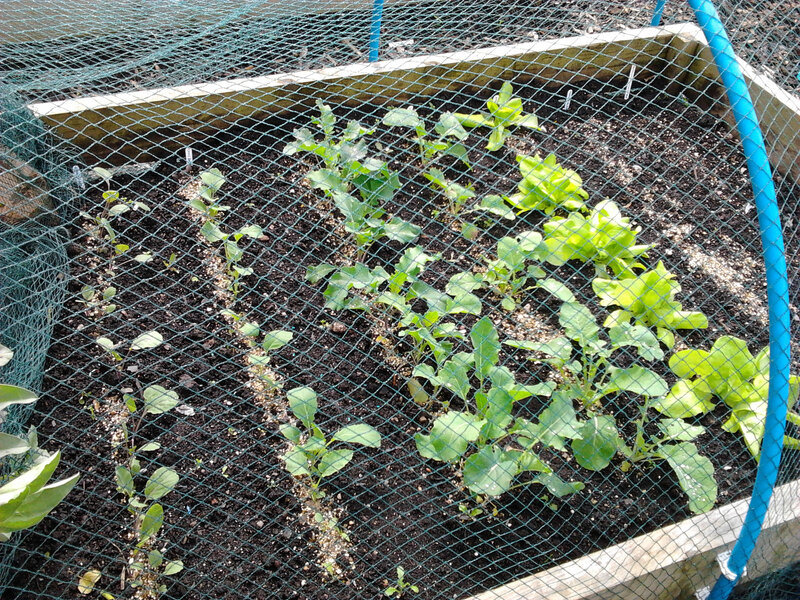 The brassicas are slowly growing but I’m sure they’ll catch up before the end of the summer. I’ve planted out the pumpkin and butternut squash but I still want to protect them for a little while to ensure a good start. Our big tomato planter is now complete and the tomato seedlings have gone in. 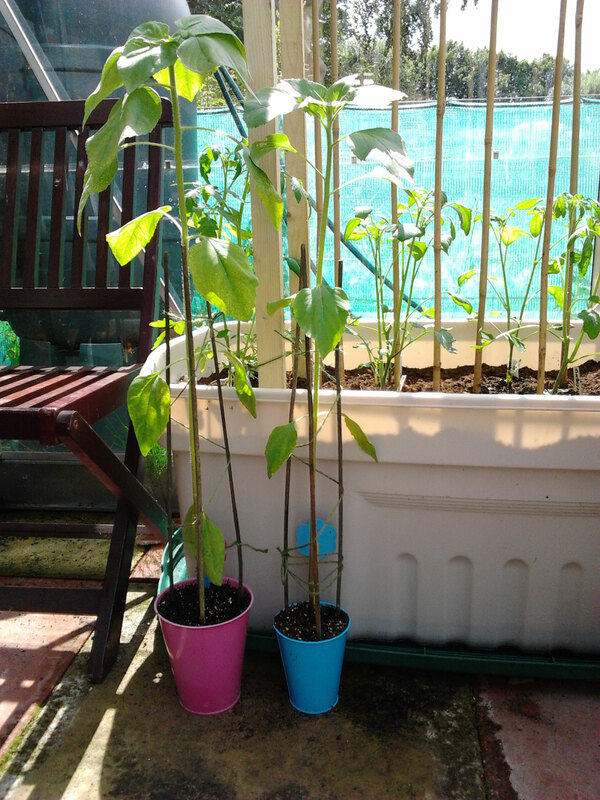 I’ve growing the same two varieties as last year, Red Alert and Sweet Olive, but I’ve also raised some beef tomatoes from seed and I will plant up one or two of them along with a lovely yellow variety, Yellow Pear Shaped and a small sweet one Tondo Piccolo. 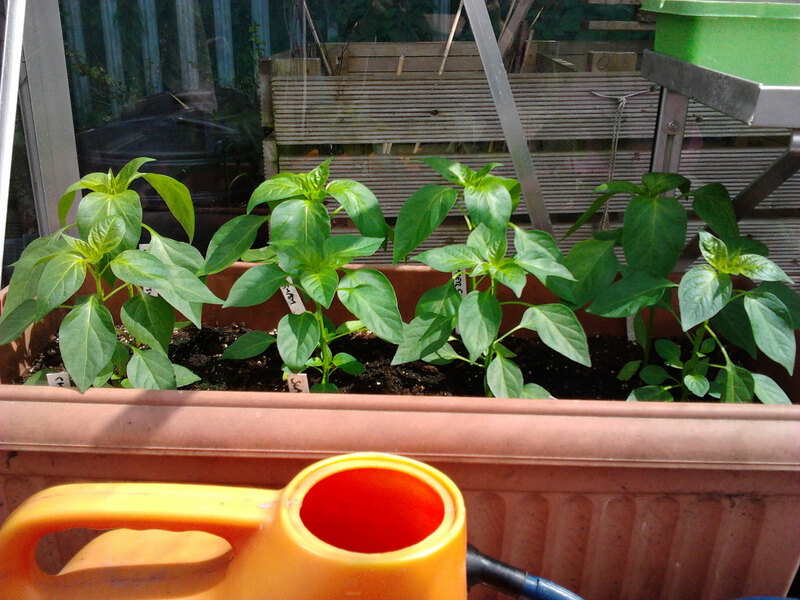 Along side the tomatoes in the greenhouse I’m growing sweet peppers and chillies too. I only sowed the peas a couple of weeks ago but they have germinated and seem to be growing well so far so fingers crossed they’ll catch up. All the raised beds are now built and one left to be dig over, we hired a Tiller from the allotment association last week to cultivate the soil, it’s done a really good job, making planting a lot easier.Fruit cages also finished and covered in bark, fruit trees from Allan’s garden are in place along with a grape vine, the strawberries are beginning to turn red and the gooseberries are plumping up so not long now.The onions and garlic planted in the autumn are doing well so we’ll have a good crop for the summer. The leeks we sowed from seed have now been planted out too. 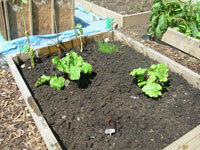 The rhubarb are giving a good crop and the potatoes are all in leaf now. 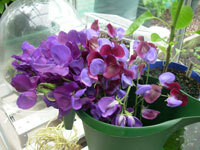 The broad beans have been in for a while and have been flowering well, pods mustn’t be too far away. 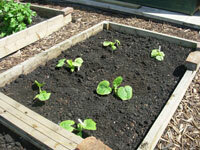 Today I planted out the brassicas including cauli, sprouts and cabbage and also sowed some peas directly in the ground. In the greenhouse the tomatoes are ready to be planted out into our large container along with the chillies and peppers. Pumpkin seeds also sprouting through. 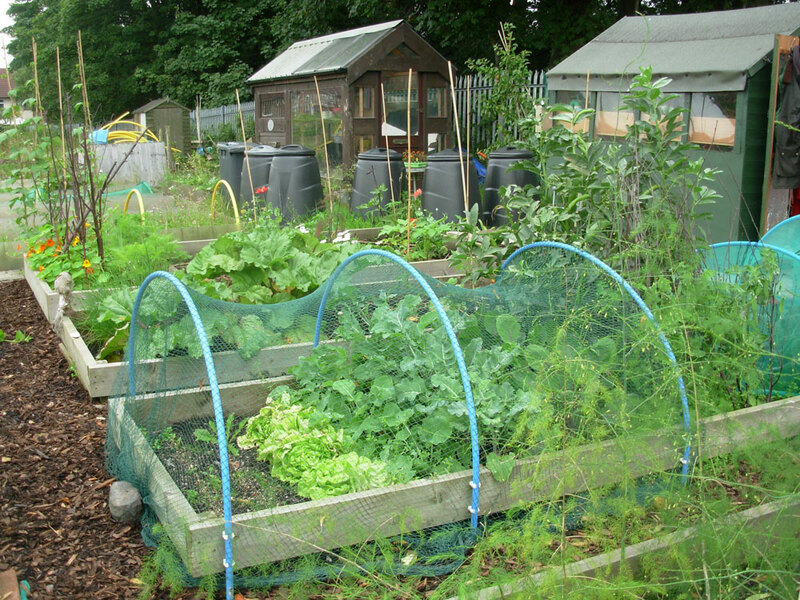 At this time of year there isn’t a lot going on at the allotment. We still have potatoes in the ground and hopefully they will be OK for a few weeks yet.The pumpkins and squashes are still doing well and should be a nice size for Halloween. 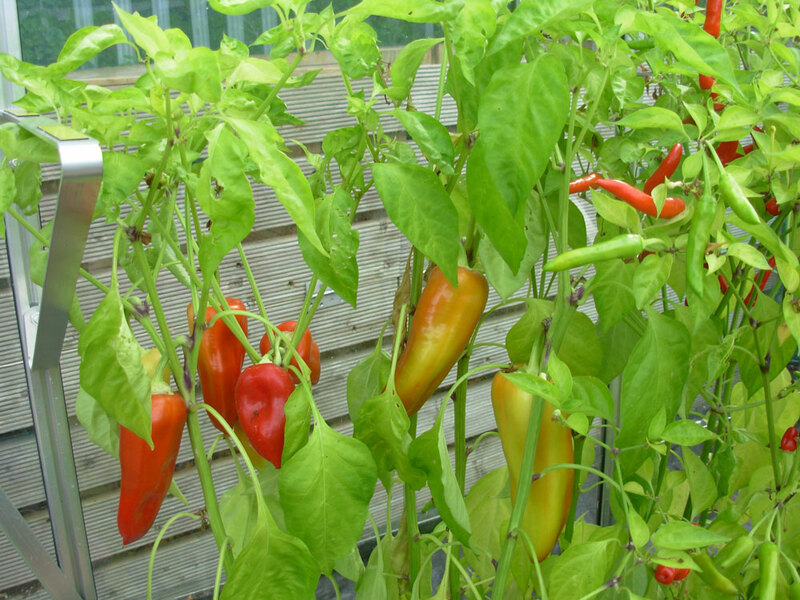 The recent sunshine will have done them a power of good but I have now covered them to keep the worst of the weather off them for the rest of the month.The peppers and chillies in the greenhouse are just ripening and will probably be over by the end of next week. Pleased with the crop. 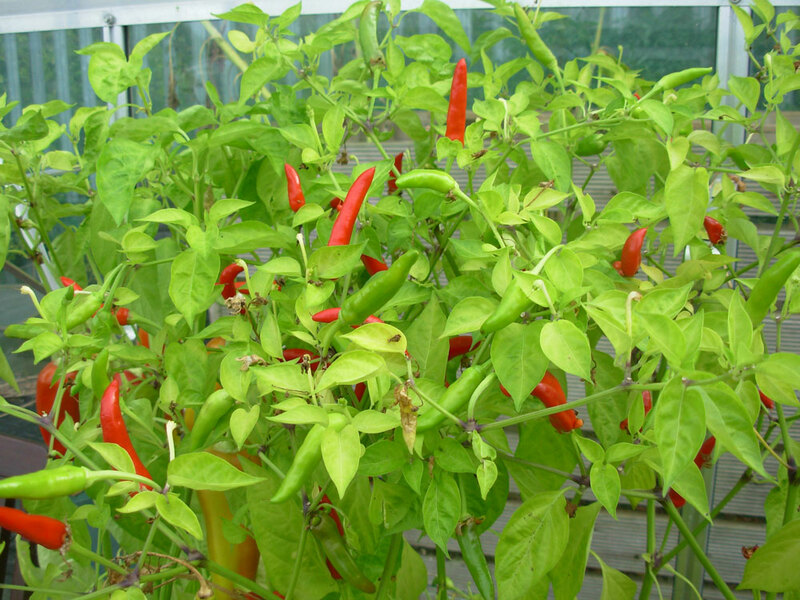 I have harvested most of the ripe chillies and have pickled them to preserve them over the winter. 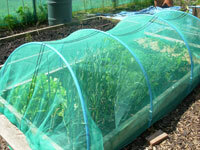 The salad and veg under our netting is doing really well and we have harvested some lettuce and carrots already. 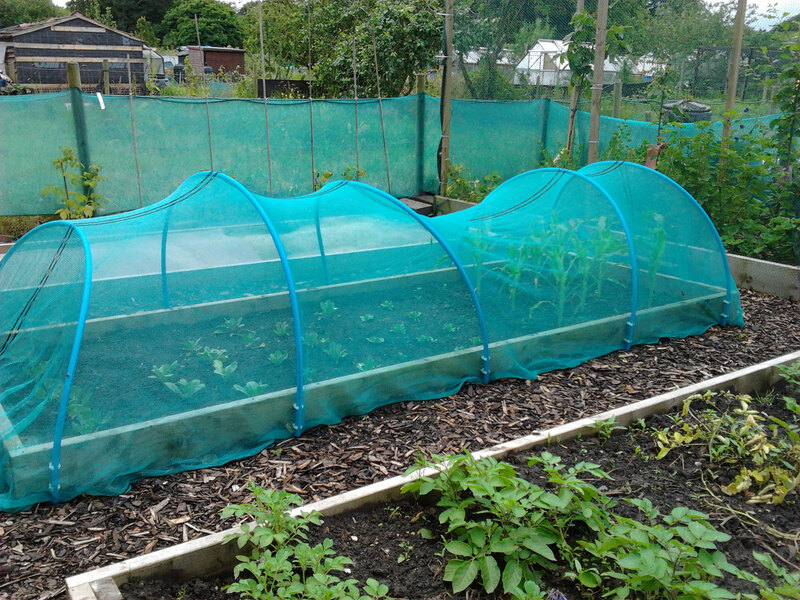 We have planted more strawberries in this tunnel but will move them into the fruit cages next year.The pumpkin seedlings have been thinned and are doing well, I suspect I’ve planted the pumpkins too close together but I’ll worry about that later. 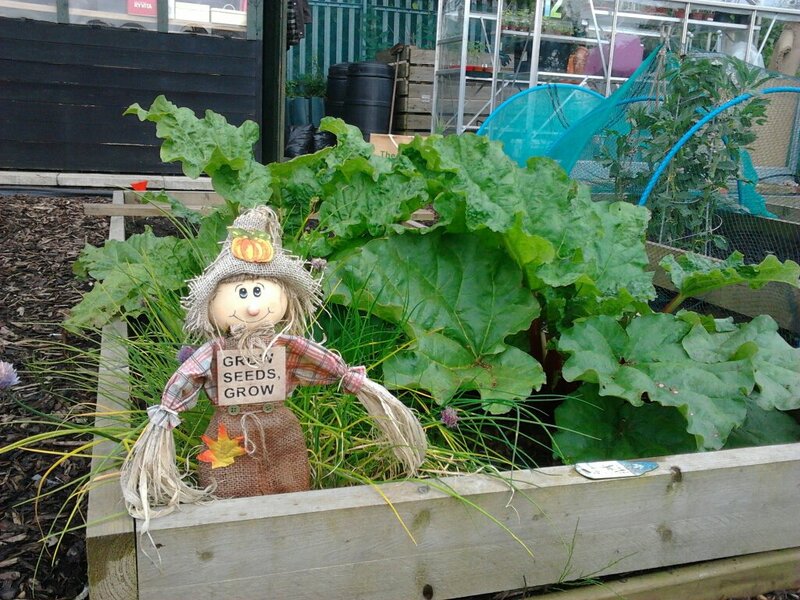 The new rhubarb have been planted, two are doing well but one is still dormant and may even be dead.The potatoes are all doing well but we are quite a way off harvesting I suspect. 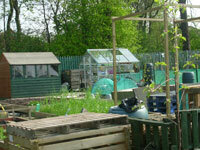 All the fruit trees have settled in well and the gooseberries, blueberries and strawberries are all fruiting. We’ve managed to harvest a few strawberries already and there are lots left. 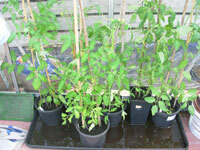 The tomatoes, peppers and chillis have been repotted into larger pots and are looking really healthy. 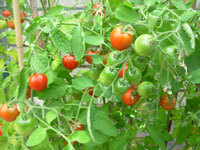 The tomatoes are flowering so as long as we keep on top of the watering they should produce a good crop of fruit. 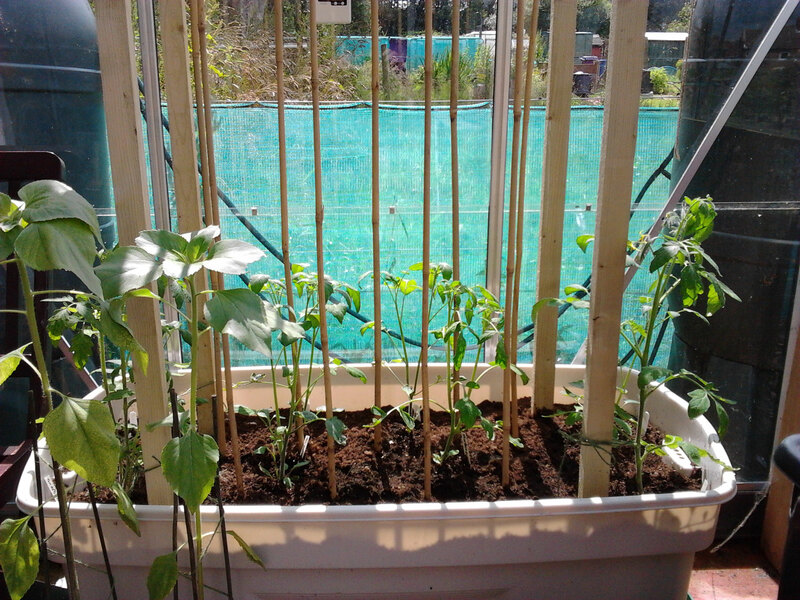 Just hoping the greenhouse is hot enough for the peppers and chillis. Some of the roof felt was blown off the shed roof a couple of weeks ago and the rain has been getting into the shed. 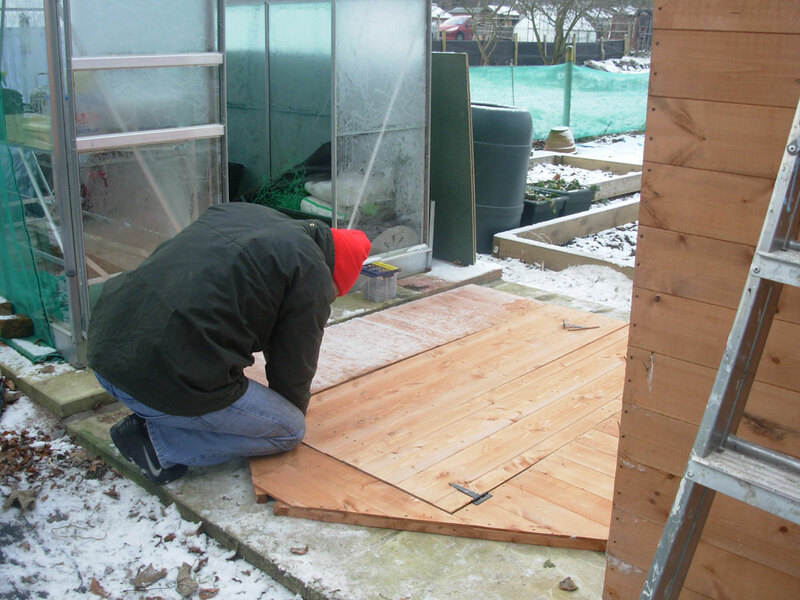 Allan managed to replace some of it on Wednesday before the heavens opened! 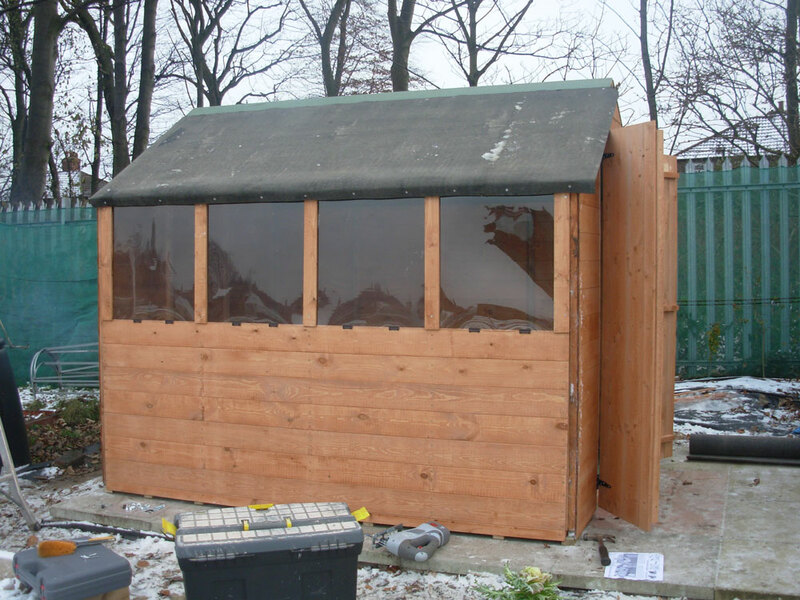 We’ve still not finished painting the shed which we must do before winter. 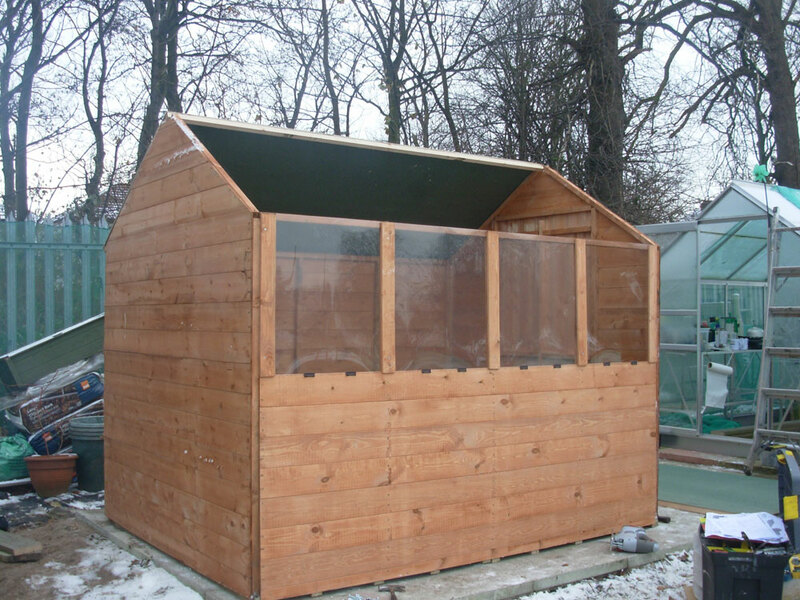 We also need to put some guttering up to stop the rain dripping down the sides of the shed. 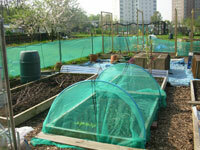 The skeleton of the fruit cages is up, we just need to attach the netting but there’s no rush to do that. 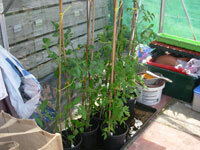 We’ve planted the Walnut Tree and under planted with some strawberries and gooseberry bushes. 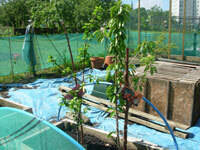 The Cherry and Plum Trees will go into the same bed along with more strawberries and blueberry bushes. Anything low growing will go under the trees. We think there will be enough light.The Asparagus bed has been planted up and the first spears are poking though as you can see below. 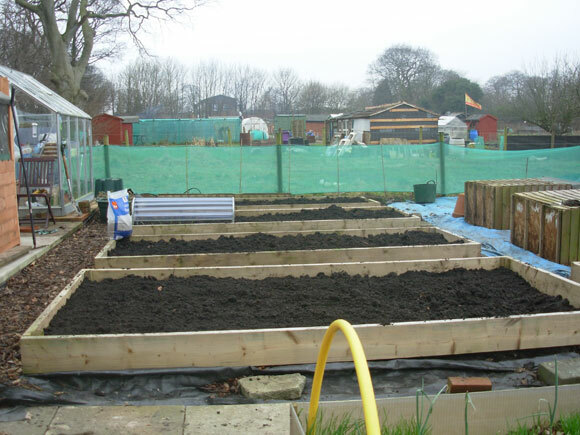 Next to the Asparagus we have a general growing bed which currently contains Garlic, Lettuce, Carrots and Spring Onions, the Onions will go in next along with some Beetroot.The next bed is growing Rhubarb, Squash and Pumpkins and the final bed is for potatoes. 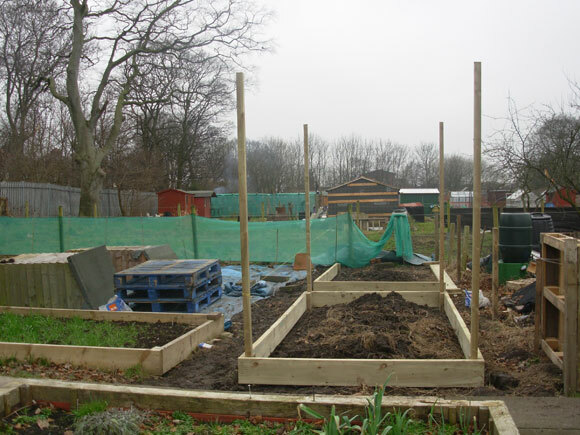 The next row only has one bed at the moment which needs digging over, once this is done we will put in some Tomatoes and Brassicas we think. 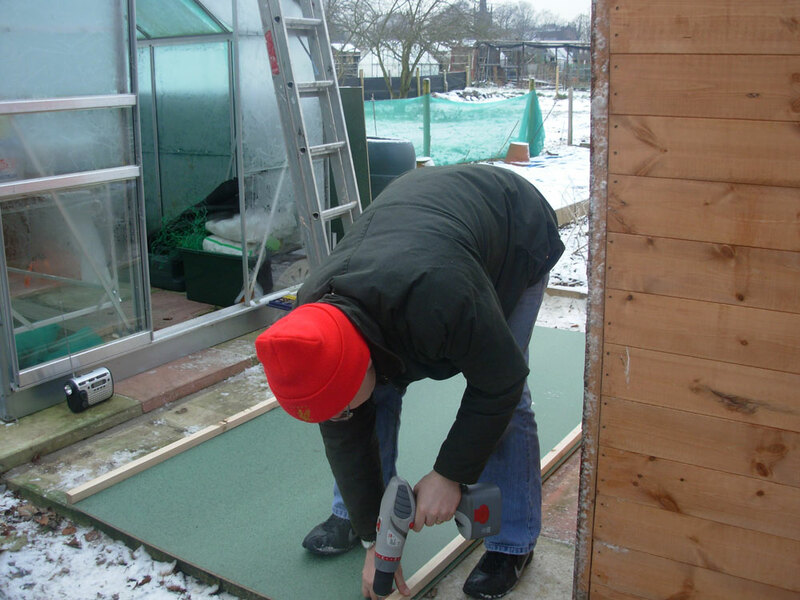 As well as sowing seed and planting out we have also painted the shed a fetching green colour and begun to add netting supports to the beds. Three tonne of top soil delivered and used to fill up the 4 raised beds nearest to the shed. Garlic planted in one bed along with some carrot seeds sown. 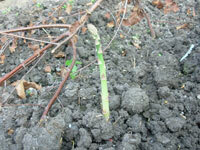 Furthest bed is to be used for the asparagus which is currently at Allans garden. 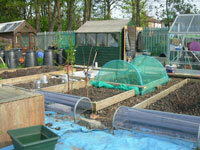 Allan also built two new raised beds which will be used as fruit cages. 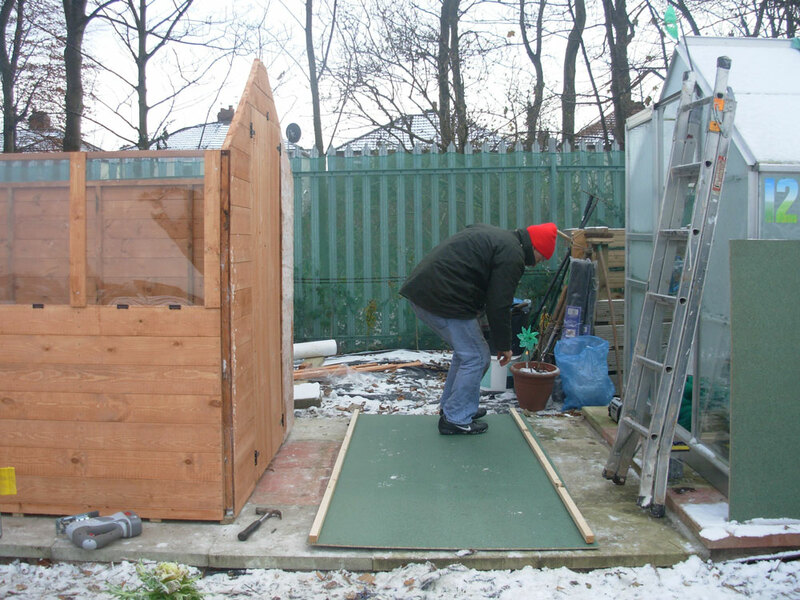 Allan and I built the shed on one of the coldest days of the year. 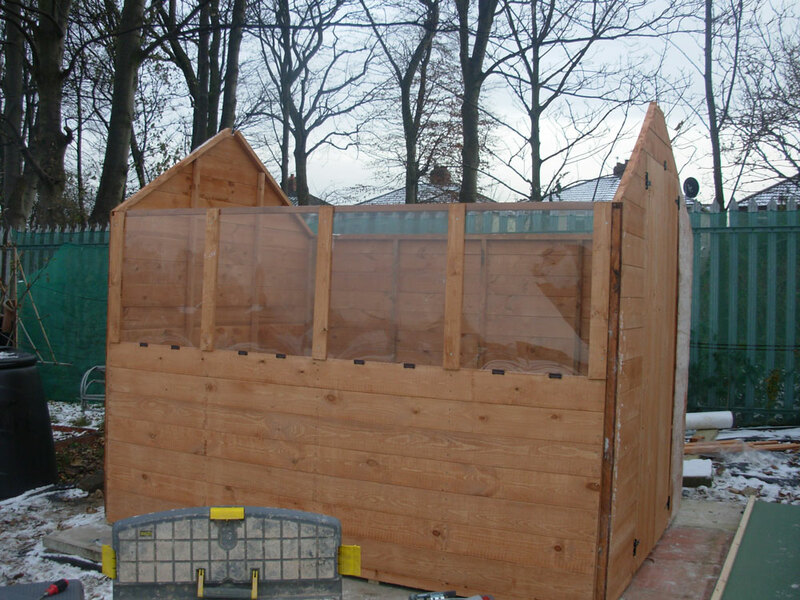 Once complete we lined it with insulation material and added some flooring to help keep it clean and dry. Shelves are now in. 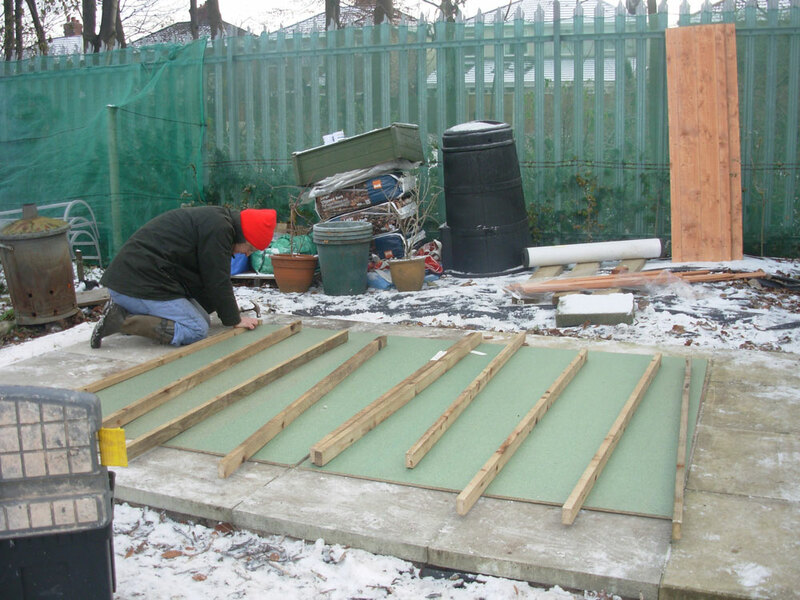 The base had been laid by Allan and his father in law and Allan is now building the greehouse. Three beds already built and poly down to keep the weeds away. 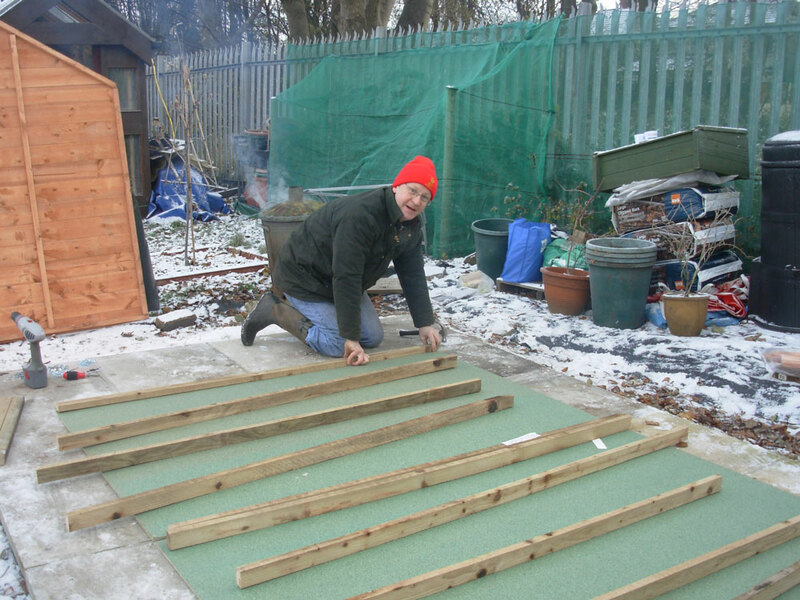 Allotment is ours and we’re marking out the positions for the shed, greenhouse, beds etc.